We’d love your help. 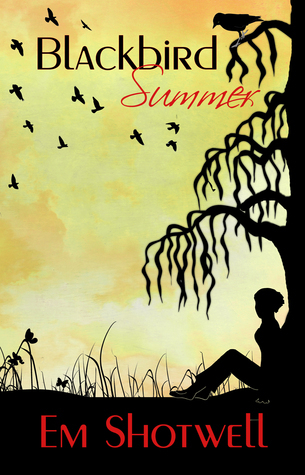 Let us know what’s wrong with this preview of Blackbird Summer by Em Shotwell. When people fear the unknown, being Gifted is a curse. No matter the Gifts prevalent in her family, at twenty-one, T When people fear the unknown, being Gifted is a curse. To ask other readers questions about Blackbird Summer, please sign up. Small southern towns dot the map, and all have their royalty and misfits. Creating the fictional town of Brooklyn, Mississippi (a town both similar, and very different from where I grew up) was a whole lot of fun. I have always rooted for the underdog and really enjoyed giving them the upper hand through magical Gifts. I hope that you enjoy Tallulah, Logan, Delia, and Thomas, and their story. I'm happy to answer any questions about the book, so feel free to ask. Having supernatural powers makes Tallulah "Tully" Caibre and her family outcasts in their hometown of Brooklyn, Mississippi. Constantly being met with mistrust at best and right out animosity at worst, they try to keep to themselves as much as possible. When tragedy strikes, Tully finds strength in her budding love with Logan who, with his dark skin, long hair and gentle nature, is completely different from the stuck up and hostile townspeople she's known all her life. But when it becomes clear that someone is out to hurt and destroy the people she loves, Tallulah knows she has to take action, backed up only by her baby sister, her cousin and two unexpected new friends. I think the book's official blurb is rather misleading. It suggests that the focus of this story is on the romance between Tully and Logan, and while that might be somehow true for the first half of the book, I appreciated that the family dynamics and ties were just as an important part of it, if not even more so. It was refreshing to read a book by an author who took as much time and effort developing some of the supporting characters as the love interest. While I liked Logan as the male lead, it was the Caibre family that really stole my heart. This was a great and original debut from a talented new author. Though up to about 50% it was pretty slow-going, the second half of the novel was totally worth the wait. Tragedy, action and a great finale. I feel like there are a few loose ends that need some tying up, but I'm quite positive that book #2 will be elaborating on those things. This is my wife's book. I read an early version, and am looking forward to the final copy! I was fortunate enough to receive an advanced copy of this book. I loved it! The characters are vivid and the story kept me guessing. It's a story of happiness and heartbreak. I laughed, I cried, I cheered...I didn't want it to end. I can't wait to read more from this series. If you enjoy stories about family bonds with a touch of fantasy and lots of intensity, this is the book for you! Wow this is a fantastic book. I've been excited about this book for a while and it not only met my expectations it completely exceeded them. This book did not disappoint. The plot twists just kept on coming and each and every one knocked me side ways. I know I've read a good book when I'm struggling to form coherent thoughts. Like now. I am so excited for this book to be published because there are so many people I want to recomm ARC kindly provided by the author in exchange for an honest review. Wow this is a fantastic book. I've been excited about this book for a while and it not only met my expectations it completely exceeded them. This book did not disappoint. The plot twists just kept on coming and each and every one knocked me side ways. I know I've read a good book when I'm struggling to form coherent thoughts. Like now. I am so excited for this book to be published because there are so many people I want to recommend it to that I know will love it also. I loved this book. The author does a great job of building an interesting world filled w characters that-even though they use magic- feel real. Fans of Sookie Stackhouse and Beautiful Creatures who are looking for their next fix from the sticks should look no further than Blackbird Summer. I can't wait for the next book in the series. This southern gothic paranormal blew me away. The take on magic was refreshingly new and the characters deep and well-developed. Fans of Beautiful Creatures who wanted something with a bit more of an adult feel to it will love this. 'Blackbird Summer' is a wonderful read from Em Shotwell. It's a highly engaging fantasy novel set in the rural South of Mississippi. Shotwell weaves a tale of love, murder and supernatural gifts. Tallulah Caibre is a twenty-one year old who lives on the outskirts of Brooklyn. Tallulah has a gift which sets her apart from other girls her age. The rest of Tallulah's family is different too and in Mississippi that's a bad thing. With difference, comes a life mapped and planned out by the family. Bu 'Blackbird Summer' is a wonderful read from Em Shotwell. It's a highly engaging fantasy novel set in the rural South of Mississippi. Shotwell weaves a tale of love, murder and supernatural gifts. Tallulah Caibre is a twenty-one year old who lives on the outskirts of Brooklyn. Tallulah has a gift which sets her apart from other girls her age. The rest of Tallulah's family is different too and in Mississippi that's a bad thing. With difference, comes a life mapped and planned out by the family. But what happens if Tallulah doesn't want to go along with the family plan anymore? What happens if Tallulah meets someone not like them? What happens if there are more secrets than Tallulah has bargained for, and there is someone with a vendetta against the family who is prepared to make them pay for their difference? 'Blackbird Summer' is an emotionally engaging fantasy novel with a sprinkling of forbidden love. ARC provided by author in exchange for honest review. In all honesty, I was weary about how I would feel about the book, I typically do not read paranormal novels. However, Blackbird Summer has proved me wrong. The entire story line was extremely relatable, even though many characters are Gifted. The small town vibe and close knit family welcomed you in. Once I noticed I was almost finished reading- I was upset the story would be ending... I hope there are many many other books to this series. Southern living, magic, and mystery make Blackbird Summer a must read! The characters are easy to fall in love with, and the story line will keep you reading! It is almost impossible to put down! So clear your schedule, grab a cup of sweet tea, and enjoy! I would like to thank NetGalley, the Publisher and Author for the free copy of this book. Blackbird Summer tells the story of Tallulah, a very special girl living in Brooklyn Mississippi, a small town where people still hang on to prejudice against anything different. Tallulah and her family are Gifted persons, and they always follow the same path and rules.. But, in this summer, she is facing hard time and hard decisions, that include Logan, an outsider. When i read the s I would like to thank NetGalley, the Publisher and Author for the free copy of this book. When i read the summary of this book, i imagined it would only about this love story between Tallulah and Logan, but it was much more than that. It is about Family, Values, the strong bond between the members of the family, it is also about what hatred and prejudice can make people do, all this with a bit of Magic. I liked the Magical part, it felt part of the character, discreet and nice, no shining spells or flying brooms but it was nice how the Author made the Gift as part of every character's soul. I really liked that. When i got to the "dark part" of the story, i was really touched. it was not because of the magic, it was only what a person with a black soul can make to other people. That feeling of Loss, of Grief was well expressed in this book and it really was the strongest part of this book. I also liked the characters of this book, Tallulah and her family, especially her sister Delia and cousin Jack were really unique, i also liked Logan ( who can help it actually!!) and i already felt i know him, since i already read The Chans. I was lucky enough to receive an ARC of Blackbird Summer and it may be the best book I’ve read in a long time. I said on Twitter that I wish Goodreads let me give a book 6 stars and it’s not a joke. The Gifted members of the family are all so wonderful that I found myself wishing I was related to them. Their Gifts were awesome but it was the love they shared and the close-knit quality of their family that drew me to them, and it was the same love that tore me apart when tragedy struck them. I was I was lucky enough to receive an ARC of Blackbird Summer and it may be the best book I’ve read in a long time. I said on Twitter that I wish Goodreads let me give a book 6 stars and it’s not a joke. The Gifted members of the family are all so wonderful that I found myself wishing I was related to them. Their Gifts were awesome but it was the love they shared and the close-knit quality of their family that drew me to them, and it was the same love that tore me apart when tragedy struck them. I was so invested in their family, in fact, that when the unthinkable happened I cried. The forbidden love story between Tully and Logan moved at a natural pace for a couple of twentysomethings, with just enough romance story trappings to make me swoon. I was rooting for them the whole time, and hoping things would work out between them in the face of the Caibre family traditions. The Caibre family had such strong traditions and folk-like tendencies that when Tully mentioned things like dial up internet and cell phones it almost seemed foreign. She and her sister Delia were complete opposites but Delia seemed to serve as the story’s link to the “future” while Tully represented the traditional “past” even though she was only a few years older than Delia. The disparity between the two sisters made their characters all the more real and when they faced some very real-world problems I felt like they were my own sisters in need of support and love. The true genius behind Shotwell’s writing is her ability to make you lose yourself in the story. I had a hard time putting it down, always telling myself I would read just one more chapter. I was also excited to see that there’s another Blackbird novel in the works and hope it’s about Delia, though I can’t imagine what can still happen in Brooklyn. I just came up for air after devouring this book in under 48 hours. Holy cow this is one of my favorite books I have ever read and without a doubt of one the best I have read this year. It's hard to even know where to begin with what I loved about this book. The setting in insanely well developed, especially for a contemporary setting. I felt like I was inside the world of Blackbird Summer as intensely as any historical or fantasy book I've read. And it is Southern Gothic gold. Full of so many ri I just came up for air after devouring this book in under 48 hours. Holy cow this is one of my favorite books I have ever read and without a doubt of one the best I have read this year. The author was kind enough to send me a copy of this book. I really enjoyed this book! It is for fans of the Beautiful Creatures series! You have Tully and her family with various Paranormal powers, living in a small southern town. In enters Logan, and everything begins to change in life, good and bad for Tully. Murder, romance, and a tight southern family set in their ways! The writing was very engaging, and I hated when I put this book down. I highly recommend picking it up! I was excited to receive an advance copy of BLACKBIRD SUMMER, so excited that I read the entire book in 2 days! It was such an easy and entertaining read. I am looking forward to reading more from this author. This is such a captivating paranormal suspense romance that will hold in its grips while you read it. This is a new auther to me but I am so glad I gave it a go. Great twist and turns and great suprise you will not see coming. The characters are brilliant and so is the interactions between them. I look forward to reading more of this authers books. This book was very good. I was guessing the whole time and I still have questions. Who was the person the chief son was found with? Will their family accept Logan now? What about the town? This is a story about a young woman who comes from a family of Gifted outcasts. "Maybe our family was the same as everyone else, we were just all too afraid of each other to show how I really felt." Tallulah is 21 years old and very rarely interacts with regular people. She has never dated, or kissed anyone and her sister refers to her as the good one or miss perfect, drives her nuts. a real attraction for, Logan a young man willing to see beyond the small town gos This is a story about a young woman who comes from a family of Gifted outcasts. "Maybe our family was the same as everyone else, we were just all too afraid of each other to show how I really felt." a real attraction for, Logan a young man willing to see beyond the small town gossip and willing to fight to stay in her life even when she doubts herself and even when things start to go bad for her and her family. Logan is a 23 year old music teacher from Louisiana who works about an hour from Tully's home town in Mississippi. " It's one of those things I really liked about Logan. He truly loved his job. Going to work and exposing kids to different types of music made him happier than almost anything else. He was convinced that the next Clapton or Hendrix was going to pass through his classroom"
The town is a major character in this story, there is so much hatred directed at this family, and small town bigotry that they have had to put up with their whole lives. Snide comments, name calling, harassment by the local preacher, and being used for their talents. Tully witnesses her beaten and raped sister being dropped into a ditch by her families fruit stand late one night while out running. The man who had done this has hidden his identity and taken notice of her hidding in the woods. Horrified she loses her grasp on her gift and calls everyone in her family to the site. Events steam roll from there. Tully, being from a family that arranges matches with other gifted families and living with a very closed off group of individuals questions Logan, his sincerity and his motives. Along with all this tragedy happening to her family and the change she undergoes because of it, will they be able to make a go of things? This is a great novel that really touches on human frailty, hatred, compassion and our ability to adapt under any circumstances. Tully goes through real changes along with her family. Tallulah, Tully for short, and the rest of her family are not like everyone else who lives in Brooklyn Mississippi. They are all gifted, meaning some can help heal others through touch, some can control the weather with just their emotions and some can manipulate people just by looking them in the eye and telling them something. The whole town knows about their gifts and even though most of the people hate them, there are a few who still go to visit them for treatments or get fruit from their stand that they own. One day out, Tully meets an outsider named Logan. She always expected to live her entire life around her family and be married off to another gifted person, but with Logan now in the picture everything changes. They are both extremely attracted to one another and try to find ways to sneak around to be with one another. Things become worse for them though after Tully’s sister Delia is raped and left in a ditch. Tully’s family vows revenge on whoever did it and know they are all on their own since the police and everyone else in town think that with them manipulating people with their gifts that Delia is lying or deserved it. I absolutely loved this story. I always thought I had things figured out, only to find out that I was wrong and wanted to keep reading without stopping to see how things would turn out. It has many surprising moments in it and finding out who was behind everything, my mouth literally dropped open from shock. Tallulah and her family go through so much with virtually no help from anyone except Logan. Tallulah and Logan’s relationship was also so cute and even though they are both so different you really root for them in the end. It’s definitely a good mystery book to read in the summer. (Crossposted from my blog) I was lucky enough to con my way into… ahem I mean, acquire an ARC of my darling Em Shotwell’s small town Southern paranormal romance, BLACKBIRD SUMMER (and then immediately bought a copy once it was live LOL). And holy crap kids, this was a FANTASTIC debut. Seriously I already want the sequel. No really. Tallulah (Tully) was such a delight of a narrator. I really felt for her dreams to find something different for herself, even though she loved her family like crazy. T (Crossposted from my blog) I was lucky enough to con my way into… ahem I mean, acquire an ARC of my darling Em Shotwell’s small town Southern paranormal romance, BLACKBIRD SUMMER (and then immediately bought a copy once it was live LOL). And holy crap kids, this was a FANTASTIC debut. Seriously I already want the sequel. No really. Tallulah (Tully) was such a delight of a narrator. I really felt for her dreams to find something different for herself, even though she loved her family like crazy. The weight of their expectation is something that was totally relatable, as was the sense of being out of place in a small town (even if it’s not for something like the Caibre Gifts). And Logan, oh lordy Logan was a doll. Talk about a man with epic amounts of chill who’s willing to do whatever it takes to be with the woman he’s falling for even in the face of some crazy abilities and horrible tragedies occurring all around them. This romance had me sighing – all the chin hands as I read it, all of them I tell you! I will warn you all though – you will want tissues. Spoiler free zone here, but the book does get dark at times. Speaking of good people, the entire Caibre family held some incredible characters. Everyone felt fleshed out and whole and someone I could have grown up with in the small town where I was born. FTC:I received a free copy of this book from the author in exchange for my honest review. I received no other compensation and the opinions expressed in this review are 100% my own. Blackbird Summer by Em Shotwell is a book that I would usually read but this year I want to read books that are out of my comfort zone and see what else is out there. I wasn’t a huge fan of this book but even with that being said I did enjoy it and I would consider reading the next book in the series. I did get into t FTC:I received a free copy of this book from the author in exchange for my honest review. I received no other compensation and the opinions expressed in this review are 100% my own. What a riveting, contemporary fiction page-turner in paranormal romantic suspense. This full length novel is filled with gut-wrenching twists & turns for an unforgettable emotional roller-coaster ride full of surprises you won't see coming! ... Great attention to detail with a totally unique story-line and so different from anything I've ever read before, that will draw you into this new world of entertaining fantasy... Witty dialogue & well defined characters that you will either love o What a riveting, contemporary fiction page-turner in paranormal romantic suspense. This full length novel is filled with gut-wrenching twists & turns for an unforgettable emotional roller-coaster ride full of surprises you won't see coming! ... Great attention to detail with a totally unique story-line and so different from anything I've ever read before, that will draw you into this new world of entertaining fantasy... Witty dialogue & well defined characters that you will either love or hate! When I started reading this book I wasn't too sure if I would like it. I had my doubts about what the story was trying to convey. At first I thought slow drama not very interesting and then it was like wow this story is pretty good. I got so caught up that I finish reading this book in about 2 hours and then was a little peeved that there wasn't more. This book gave the impression that the story was based during a time when people had a really narrow view of the word at first and I almost thought When I started reading this book I wasn't too sure if I would like it. I had my doubts about what the story was trying to convey. At first I thought slow drama not very interesting and then it was like wow this story is pretty good. I got so caught up that I finish reading this book in about 2 hours and then was a little peeved that there wasn't more. This book gave the impression that the story was based during a time when people had a really narrow view of the word at first and I almost thought this was meant to be material based on the past, then it gave the appearance of being in the 21st century with back woods attitude. If you're different in any way, if you don't conform to the Hellfire preacher then your damned, and there are always people willing to make your life miserable. This family didn't hurt anyone they kept to themselves and help anyone who asked for it but the things that they suffered through by this town it was horrible. This book is by no means the end of the story stay tuned for volume two. I was fortunate enough to receive an ARC copy of this book in exchange for an honest review. Once I started reading this book, I couldn't put it down. The story line and characters are so engaging and Em's writing style enchants you with flowing descriptive narratives and paints the surrounding landscape in a way that was both magical and eerie at the same time. This was not my typical genre but I really found myself on the edge of my seat to see what twist and turn was coming up next. I found my I was fortunate enough to receive an ARC copy of this book in exchange for an honest review. Once I started reading this book, I couldn't put it down. The story line and characters are so engaging and Em's writing style enchants you with flowing descriptive narratives and paints the surrounding landscape in a way that was both magical and eerie at the same time. This was not my typical genre but I really found myself on the edge of my seat to see what twist and turn was coming up next. I found myself, gasping, cheering, laughing and crying the whole time and was sad to see the story end. I hope there is more in store for these characters. This one is going on my favorites list and I plan on telling everyone I know to read this book. Cheers to a great book... pick this one up and give it a try! This is truly a Dark Gothic novel. It was dripping with Southern charm, despite the dark portions of the story. Every character was well constructed and believable. Paranormal with tinges of fantasy, but it's also a coming-of-age and family drama. Throw in an unsolvable (for me) mystery and a little romance, and you've got the beginnings of a great series. Highly suggested for those who like books with a little bit of everything and like reading I received an ARC in exchange for my honest review. The story is about modern-day x-men-style people living in the South, and their struggle to maintain a normal existence despite the prejudice that surrounds them and their powers. The writing is vivid and fun. I'd say light-hearted, but there are times where this book is anything but light-hearted. It ultimately got to the point where I didn't want to (nay, couldn't) put it down. Every time I said I was going to put it down and go to sleep, I found myself turning another page and getting sucked The story is about modern-day x-men-style people living in the South, and their struggle to maintain a normal existence despite the prejudice that surrounds them and their powers. Mama. Wife. Wonder Woman. Author of the Blackbird Summer series, Murphey Family Saga, & nefarious Womens Fiction. Lover of food, music, & sarcasm. Always dreaming.